Christine Rose, CG, CGL, FASG and have received excellent reviews in the national journals. 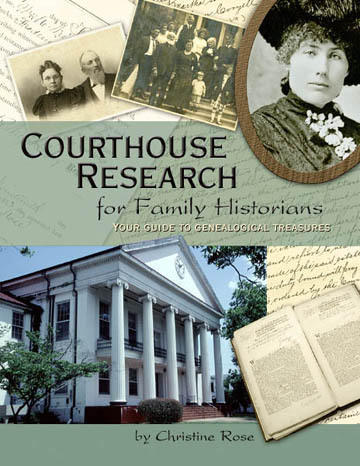 COURTHOUSE RESEARCH FOR FAMILY HISTORIANS: Your Guide to Genealogical Treasures. Learn every step of courthouse research! Helpful whether you go in person, or do your research through microfilm or mail. High reviews. $21.98 plus $6.45 shipping. 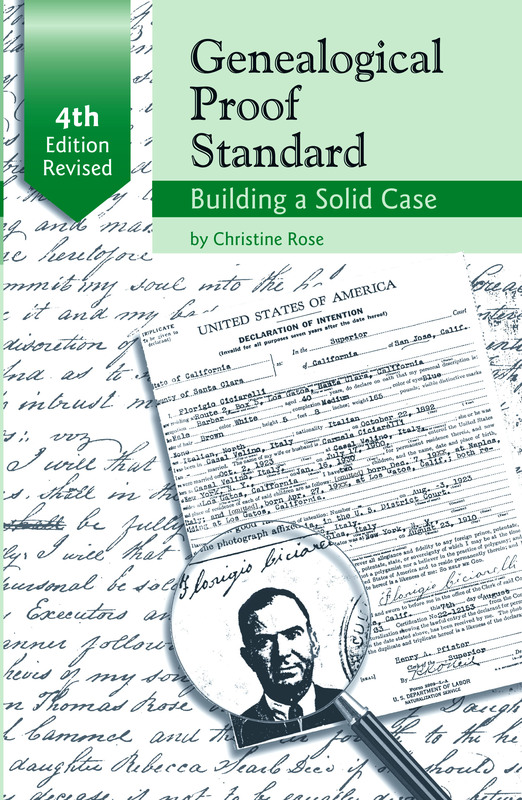 GENEALOGICAL PROOF STANDARD: Building a Solid Case. Includes a discussion of the elements of building a case and weighing the evidence under present-day standards, 4th ed.. Publ. 2014. $9.95 plus $3.00 shipping. Courthouse Indexes Illustrated. Published in 2006. 72 pages. 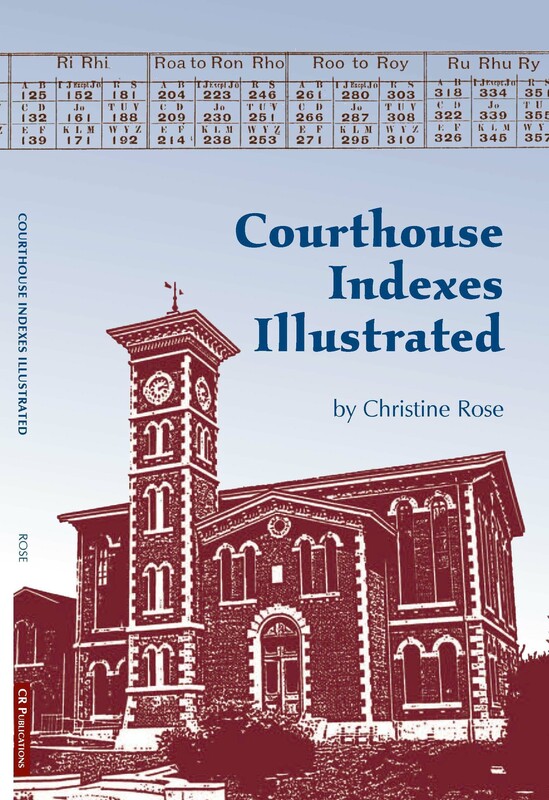 Over 30 illustrations with easy-to-follow instructions to use the myriad indexes found at courthouses. This is a "must" guidebook whether you go personally to the courthouse, or use microfilm. By Christine Rose, and available for $9.95 plus $3.00 postage. THE COMPLETE IDIOT'S GUIDE TO GENEALOGY. The 3rd edition of this guidebook has been updated in all chapters including extensive revision of the chapters on DNA and the Internet. It also includes an entirely new chapter on African-American research. An absolutely "must read" for all genealogists. This book goes far beyond what is available on the Internet. Though it includes many Internet sites to help genealogists, it also has chapters on Courthouse research, Census search, Cemetery search, and much more. 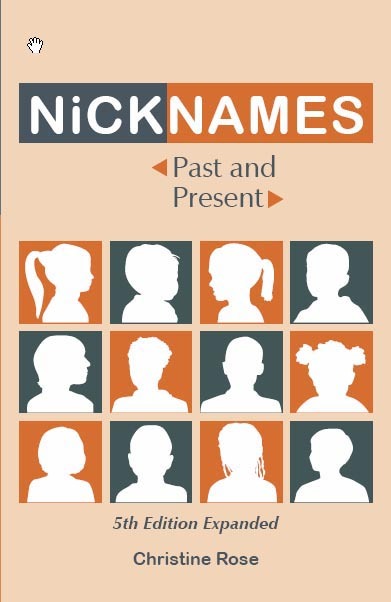 It includes a chapter on organizing research, another on what to watch for in naming, changes in our calendar system, etc. Noted genealogists - Elizabeth Shown Mills, CG, CGL, FASG, FNGS, Ralph J. Crandall former executor director New England Historic Genealogical Society, Megan Smolenyak, author of DNA publicatons, David E. Rencher, lecturer and consultant, and Tony Burroughs, author and lecturer, have all endorsed the book with their comments on the cover. Price $19.95 plus $5.15 shipping, available from the author (see book form below). Or, obtain from your local bookstore. MILITARY PENSION ACTS 1776-1858: from the Journals of the Continental Congress and the United States Statutes-at-Large. By understanding the pension laws, we then have the basis for a search. $11.00 plus $6.45 shipping. FAMILY ASSOCIATIONS: ORGANIZATION AND MANAGEMENT, a Handbook. Everything to get you going from preliminaries, record keeping, publishing a Newsletter, the Family Gathering, sample By-laws and much more. 3RD ed. revised and enlarged 2001. $14.75 plus $6.45 shipping. DECLARATIONS OF INTENTION OF SANTA CLARA CO., CALIF. (1850-1870). Includes all the pertinent information from the declaration. Fully indexed. 1990. $12.00 plus $3.00 shipping.